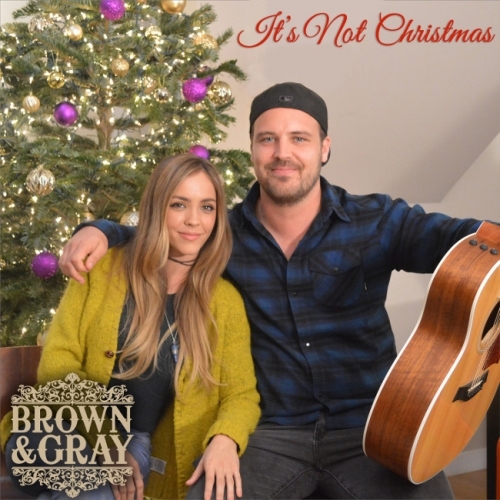 It’s been a remarkable year for Nashville-raised Kaci Brown and London-based singer-songwriter Sam Gray, better known as the country duo Brown & Gray. With the release of their debut single, Top Down, a little over a year ago, the Anglo-US duo found the track being championed on the biggest national country music station in the US, Sirius XM’s The Highway. This led them to being featured as one of Rolling Stone's Top 10 Country artists for 2018 and being booked into over 30 festivals shows after signing with William Morris Endeavour. Back here in the UK, the track was added to Radio 2’s playlists and then a club remix version catapulted it into the top ten UK Dance chart while in the US it was picked up by Radio Disney and Sirius XM’s Hits 1 spending more than a month in the Billboard Top 40 radio airplay chart. With over 10m combined streams, 40k iTunes downloads and millions of YouTube views later, the duo are back with this beautiful country-tinged Christmas number about yearning to be with a loved one at this special time of the year. It's a perfect addition to your Christmas playlists that will warm anyone's hearts this cold Christmas.